Hetal, 32, a housewife started with a weight loss program 3 months ago after which she lost about 10kg. But now, she has started losing a lot of hair and is extremely worried about it. Hetal is not alone. 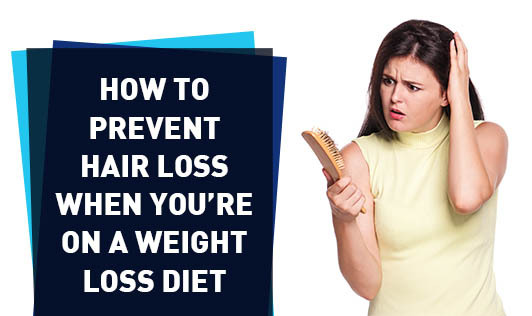 With unreasonable weight loss goals and crash diets becoming a fad, the trend of losing hair is becoming a very common phenomenon among the weight-watchers. Dietary restrictions common in crash diets lead to the deficiency of vital micronutrients like biotin, patothenate, and essential fatty acids, thereby depriving the hair roots of nourishment, making them dry and rough, ultimately leading to hair fall. Consult your dietitian and start with hair nutrient supplements that contain 14 essential vitamins and minerals especially biotin, amino acids, and calcium pantothenate. Include soya, sprouts, cottage cheese (paneer), yogurt/curd, buttermilk, and egg whites in your diet. Add color to your diet. Include yellow, orange, and red colored fruits, green vegetables, and salads like carrots, tomatoes, beetroots, and cucumbers. Omega 3 adds shine and prevents hair loss. Take 3 walnuts and 1 tablespoon of flaxseeds daily. Drink 2 to 3 liters of water daily. Water is essential for hair. Start with natural home treatments for hair early on. Opt for treatments delivering nutrients directly to the root of hair- such as a warm coconut oil massage. Strong, healthy roots will prevent hair fall. Do not skip meals. Reduce your portion size instead. Have small, frequent balanced meals. Cut down on carbs, but do not avoid them completely. Avoid saturated fats and trans fats though. Avoid food containing preservatives such as ketchups, sauces, pickles, and ready to eat foods. Avoid smoking. Smoking prevents the nutrients from reaching your hair roots. Avoid salon treatments that break the hair bonds like: straightening, coloring, and ironing. Avoid frequent use of blow dryers especially set on the hot mode. Do not neglect itchy scalp and dandruff, as it can weaken hair roots. Use an antifungal shampoo twice a week, to avoid fungal infections.